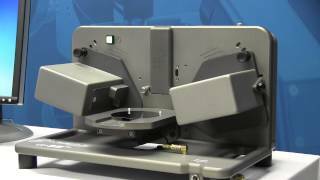 For routine measurements of thin film thickness and refractive index, this ellipsometer allows you to mount a sample, choose the model that matches your film, and press "measure". You have results within seconds. The Alpha-SE is a very accurate and easy-to-use system to determine optical constants, thickness, index gradient, composition, etc. With fast measurement speed and push-button operation, the Alpha-SE is ideal for qualifying thin films. Single-layer dielectrics on silicon or glass substrates can be measured in seconds. Log results for easy-to-use comparisons in both graphical and tabular formats. Phase information of a spectroscopic ellipsometry measurement is highly sensitive to very thin films (<10 nm). Self-assembled monolayers can be assessed and quickly compared using the Alpha-SE.